MIAMI, FL – March 21, 2019 – Baptist Health South Florida’s Grand Gala was an extraordinary success, raising more than $6.5 million. Attended by more than 2,000 guests, it was the largest social and fundraising event in the leading healthcare organization’s history, with proceeds uniquely benefiting the Baptist Health cause of each gala-goer’s choice – including Miami Cancer Institute, Miami Cardiac & Vascular Institute, Miami Orthopedics & Sports Medicine Institute, or any of the healthcare organization’s 10 hospitals and clinical, community or educational programs from the Florida Keys to Palm Beach. Presented by title sponsor MEDNAX Health Solutions Partner, The Grand Gala took place on Saturday, March 16, in the newly renovated Miami Beach Convention Center Ballroom. The exquisite affair was attended by notable guests including co-chairs, Baptist Health President & CEO Brian E. Keeley and Suzanne Keeley, Ph.D., and Lani Kahn Drody, host committee chair. 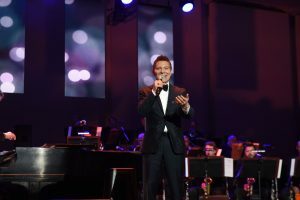 Michael Feinstein, the multi-platinum-selling, five-time Grammy-nominated singer and pianist dubbed “The Ambassador of the Great American Songbook,” proudly served as The Grand Gala’s headline entertainer, and captivated guests with a 45-minute performance of iconic songs, including “New York, New York,” “Bye Bye Birdie,” and “Our Love is Here to Stay. Guests had the unique opportunity to direct their funds to the Baptist Health cause of their choice. They danced the night away in the newly refurbished Miami Beach Convention Center’s largest ballroom, with a dedicated entrance and concierge services. This also was the first grand event to take place at the Center this year following its multi-million-dollar renovation. A live and silent auction featured rare experiences and professionally curated items. Live auction experiences were donated by American Airlines, Crystal Cruises, Domaine Souviou, Regent Seven Seas, British Airways, Tiffany & Co. and St. Regis. During the Gala, the chairs made quick yet moving remarks, including Mr. Keeley, who said, “You all were given the opportunity to designate your dollars to the Baptist Health cause that means the most to you. Through this unique approach, your gifts will make an impact in the lives of patients throughout our service area, from Palm Beach to the Florida Keys.” Mr. Keeley noted that Baptist Health’s pursuit of providing charity care and community service totaled more than $300 million in 2018 alone. “Philanthropy allows us to continue to provide the latest, most innovative technology, such as proton therapy, robotics, and new MRI radiation therapy, and to house them in attractive, patient-friendly surroundings. Simply stated, philanthropy allows us to transition from ‘good’ to ‘great,’ and can make the difference between excellent care and extraordinary care,” Mr. Keeley concluded. Mr. Keeley acknowledged Dr. Bill Banchs, Baptist Health Foundation’s CEO emeritus, who retired in January after leading the foundation for five years, during which time philanthropic funds more than doubled, surpassing $30 million last year alone. Mr. Keeley also mentioned the newly-appointed CEO of the Foundation, Alexandra Villoch, President and Publisher of the Miami Herald Media Company. “She’s a proven business executive and community leader with a long-time involvement in South Florida philanthropy. As people know, Alex is a high-energy executive and is prepared to take our Foundation to the next level,” said Mr. Keeley. Generous sponsors of The Grand Gala include Title Sponsor MEDNAX Health Solutions Partner; Diamond Sponsors Envision Physician Services, FPL and KIDZ Medical Services; Gold Sponsors Bank of America, CC Homes, Humana, Leon Medical Centers, Navigant, Norwegian Cruise Line Holdings and Watsco; the Official Sports Team Partner, The Miami HEAT; Honorary Chairs the Carricarte Family, Gonzalez Gorrin Family, Susan Kahn, Michele and Howard Kessler, the Korn Rico-Toro Family and The John and Margaret A. Krupa Foundation; Bronze Sponsors American Airlines, Bacardi, Cerner, The Collection, Conviva Care Solutions, Emergent Physicians of South Florida, Florida National University and Insightec. For more information, please visit https://baptisthealthgrandgala.org/. For more downloadable photos, click here. Baptist Health South Florida is the largest healthcare organization in the region, with 10 hospitals (Baptist Hospital, Baptist Children’s Hospital, Bethesda Hospital East, Bethesda Hospital West, Doctors Hospital, Fishermen’s Community Hospital, Homestead Hospital, Mariners Hospital, South Miami Hospital and West Kendall Baptist Hospital), more than 40 physician practices, 50 outpatient and urgent care facilities, Baptist Health Medical Group, Baptist Health Quality Network and internationally renowned centers of excellence spanning across Monroe, Miami-Dade, Broward and Palm Beach counties. A not-for-profit organization supported by philanthropy and committed to our faith-based charitable mission of medical excellence, Baptist Health has more than 19,500 employees and more than 3,000 affiliated physicians. Baptist Health South Florida has been recognized by Fortune as one of the 100 Best Companies to Work For in America and by Ethisphere as one of the World’s Most Ethical Companies. By using this Site, I agree to it's Terms & Conditions. All content downloaded form the Site (photography, audio and video, etc.) may be used for editorial purposes only. Any other use of Site content including without limitation personal or commercial use, is strictly prohibited. Copyright © 2016 Baptist Health South Florida. All Rights Reserved.